Summer time means a lot of things, warm nights, endless sunshine, and the best grilling weather I could ever ask for. While the grilling weather certainly fits my clothes, it also means an abundant supply of fresh local produce. When it comes to grilling a side of vegetables with dinner, nothing beats food sourced from a local farmer or purveyor. When it comes to vegetables, there is nothing I hold back from the grate. That said, I do have my favorites and asparagus is solidly in the “like” column. While lightly oiled spears of asparagus kissed by smoke and heat are fabulous, I prefer them with a little something extra. Enter: prosciutto. I guess I shouldn’t really be surprised. Everything is better with pork, especially when it’s thinly sliced and dry cured. Note: While you can get some great pre-packaged prosciutto, take the extra step and have it sliced at the deli counter. It’s well worth the effort. Also, if have more than 10 asparagus spears, figure 1 slice of prosciutto per 2 spears. 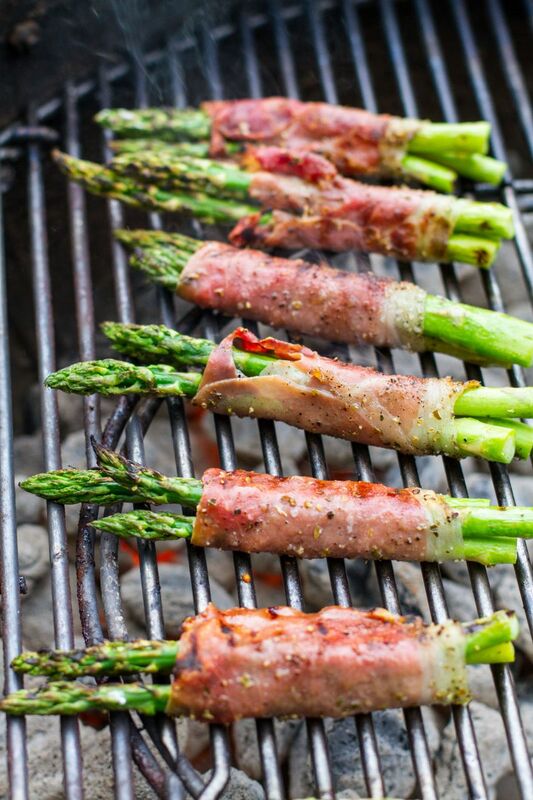 Take 2 spears of asparagus and wrap in 1 piece of prosciutto. Gently brush with olive oil and season with salt and pepper. Grill the asparagus over direct medium heat (350 F), approximately 6 - 8 minutes, turning once. Remove from the grill and drizzle with freshly squeezed lemon. Serve. Not only are these great with dinner, it’s the one vegetable I love to take out of the fridge the next morning and eat cold. The salt encrusted spear makes a great meal, either for dinner or breakfast.